Every year, eating healthier appears somewhere -- if not first -- on lists of New Year's resolutions. If this is one of your goals for 2018, here's a tasty and healthy broccoli recipe to whet your appetite. In 2011, I posted a Broccoli with Lemon recipe made with butter, lemon juice, salt, pepper and, of course, broccoli. The recipe I'm sharing today, courtesy of one of my sisters-in-law, has the same name, but not the same ingredients. The new recipe includes the addition of chicken broth and, instead of butter, olive oil. These two ingredients give the broccoli a robust -- rather than citrusy -- flavor. One thing to remember is not all olive oils are the same. Although olive oils are graded according to their level of acidity, the flavor, color and fragrance depends on where the olives were grown. Extra virgin olive oil -- the most expensive -- comes from the first pressing of the olives and contains no more than 1% acid. The next grade, virgin olive oil, also comes from the first pressing, but contains up to 3% acid. A good rule of thumb is the darker the olive oil, the more flavor it contains. The last few times I've prepared this dish, I've taken some shortcuts. Rather than buy a head of broccoli and cut it into pieces, I use a bag of precut broccoli. It may cost a little more, but I find the time saved is worth the splurge. Instead of cooking the broccoli in a steamer basket over a pot of boiling water, I rinse the broccoli and cook it 3 to 4 minutes in the microwave in a covered micro-cooker I bought from Pampered Chef many years ago. If you need to watch your salt intake, you can substitute low sodium chicken broth and omit the 1/4 teaspoon salt called for in the recipe. 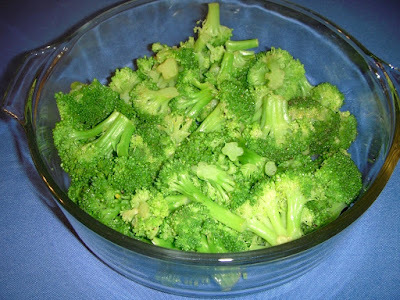 If you prefer broccoli like the version pictured below, check back soon for a truly cheesy recipe. In the meantime, here's a broccoli recipe that's better for you. 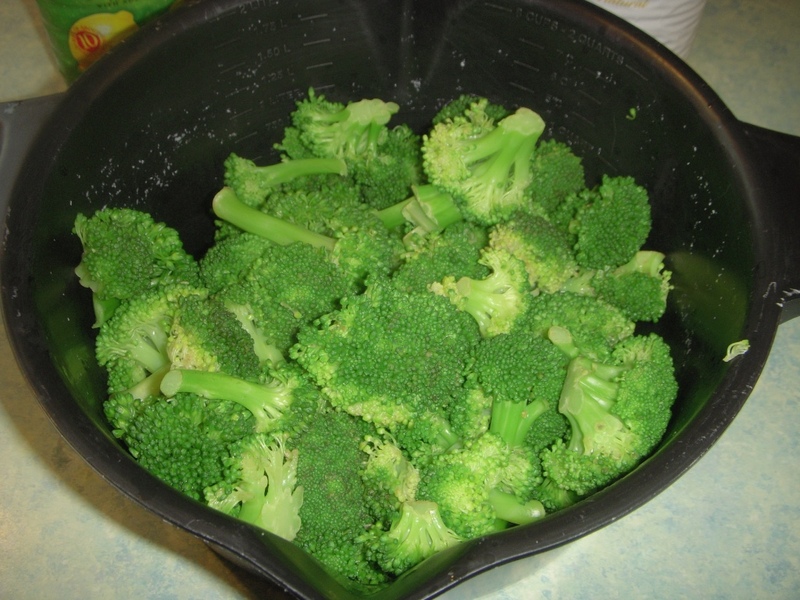 Arrange broccoli in a steamer basket over 1-inch of boiling water. Cover and steam 6 to 8 minutes, or until crisp-tender. Drain; set aside. Combine remaining ingredients; pour over broccoli and toss to coat. I usually just add butter and onion powder, but I'd like to try something different. This sounds good (and better for you). Can't wait for your cheesy recipe, though. Thanks, Tracy! The broccoli with cheese recipe is soooo good, but not nearly as healthy as the Broccoli with Lemon!